What’s the best way to deal with urban smog? Well, here’s an intriguing solution – vertical gardens that scale up buildings. Several such projects have already sprung up around the world, in places like Italy and Mexico. Now, an Italian architecture firm called Stefano Boeri Architetti is planning to build the first one in Asia, specifically in Nanjing, China. 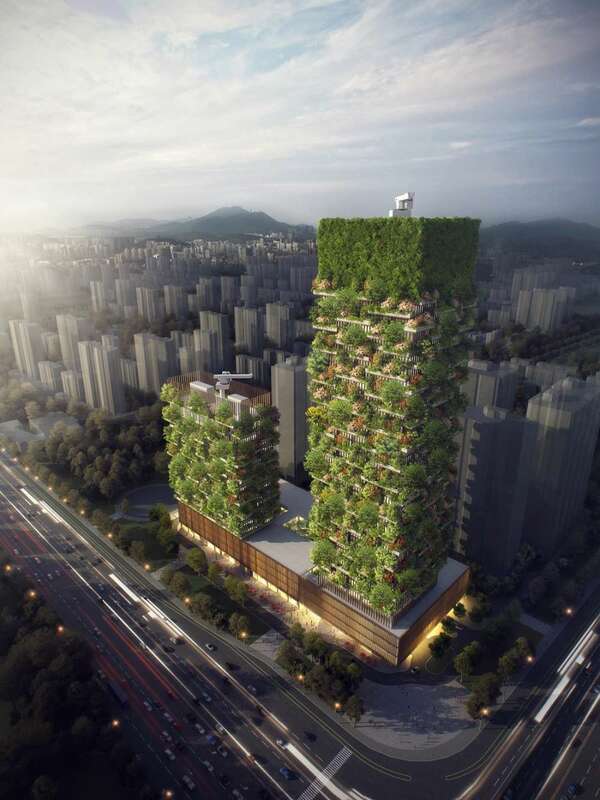 The firm is planning to build two towers laden with greenery, known as a Vertical Forest or the Nanjing Green Towers, in Nanjing’s Pukou District. Due to be completed in 2018, the towers would be covered in 600 tall trees, 500 medium-sized trees, and 2,500 cascading plants and shrubs. In total, this would cover an area of 6,000 square meters (64,600 square feet). “A real vertical forest that will help to regenerate local biodiversity, will provide 25 tons of CO2 absorption each year and will produce about 60 kg of oxygen per day,” the firm said in its statement. The taller of the two towers would be 200 meters (656 feet) high, with a “green lantern” on top, offices, a museum, a private rooftop club, and a “green architecture school”. The second tower would be 108 meters (354 feet) tall, with a Hyatt hotel inside and a swimming pool on the rooftop. Nice. The firm said that these constructions help increase biodiversity, providing a place for birds and insects to colonize. The diverse plants also help to create humidity and absorb CO2 and dust, producing oxygen in the process. Green urban architecture has been around for a while. In Stuttgart, Germany, for example, around a quarter of all flat roofs are green, while London has 121,000 square meters (1.3 million square feet) of greenery on roofs. China’s smog problem is no secret, with Beijing in particular suffering immensely in recent years. Are vertical forests the answer? Who knows. But it’s a pretty neat idea – and they look pretty good too.